September is a very pleasant month to see Nova Scotia. Things are busy until Labour Day, on the first Monday of the month. This holiday makes the last long weekend of the summer – the final chance for many people to slip away to the cottage. After Labour Day, everything is quieter because the kids are back in school. The weather cools down noticeably from hot August but tends to stay sunny, with daily temperatures around 18-20°C. The tourism season winds down in September but most attractions stay open at least until the middle of the month. There are still plenty of things to enjoy, including the Atlantic Fringe Festival in Halifax and hiking in Cape Breton island. This is a perfect time to tour the Cabot Trail. By late September, cooler nights bring on the first of the beautiful fall leaves. 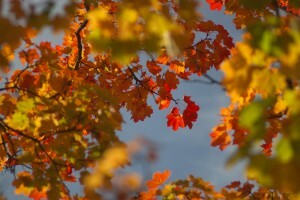 As the days lead into October, the trees turn gorgeous shades of red, yellow, orange and gold. Go to Cape Breton and the Wentworth Valley in central Nova Scotia to see some of the best fall foliage.